Black Friday 2012 is now a day of the past. How it went for retailers nationwide is still being tabulated. I went out today to do my Black Friday shopping. Hubby and I whipped into the parking lot of Lowe's Home Improvement and snagged a coveted parking space next to the building. It was the Black Friday Field of Dreams. The bases were loaded at the Lowe's Home Improvement. We could hear the crowds cheering and we were off! We wrestled into position and grabbed the last poinsettias off the shelf. Our next move was to dodge the other shoppers and slide into the home base checkout line. It was our first Black Friday homerun of the season! We sprinted out the door at lightning speed as the stands went wild! Well, umm... The shopping scenario might be slightly exaggerated. The truth is that we did actually go to Lowes. The story departs from reality after that. In reality here's what happened for us on Black Friday 2012. The Lowe's Home Improvement parking lot actually had several parking places by the front door and there was a large display of beautiful poinsettias. We took our time choosing and then went to price check a couple of items. Hubby and I were in and out in 30 minutes tops. Both of us expected our WalMart Black Friday stop to be a doozie. Hubby slid my PT Cruiser into about the 4th spot from the end of the row closest to the building. He and I picked up the items we needed and price checked the big item that I wanted. The three people ahead of us checked out pretty quickly. 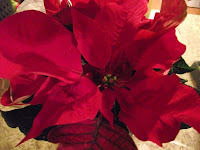 It took us longer to drive back to Lowe's for more poinsettias than time actually spent at WalMart. I'd say that we spent about 20 minutes in the store. Our Black Friday 2012 experience was a lot different than I'd expected. Each store was doing business but neither was overly crowded. We racked up a couple of bargains at each stop but the day was fairly anti-climatic. Our big excitement was getting Lowe's to price-match a non-Black Friday item. I can't tell you about it until after Christmas. Let me tell you, it was our happiest score of the day. Black Friday was still a lot of fun. However; it now lives in history. I have shopping to do tomorrow and then we can get ready for the Christmas parade in Etowah, Tennessee. We hear that the Senior Citizens center there has is rocking homemade cookies and soup.